Not every business wants to use an external professional telemarketing agency like GSA that has trained callers and the appropriate telemarketing CRM systems. Some businesses prefer to keep things in-house where they can retain control of the whole process of lead generation. There’s no right or wrong of course with regard to whether you outsource telemarketing or do it internally. The key is that it is done professionally and that it delivers an appropriate return on investment. Either way, it’s important that whoever undertakes the calling is trained both on the campaign itself and in order to have the appropriate skills to do the job. The marketplace – what’s going on? What are the drivers? What type of customers is the business targeting? The prospect audience – who is the decision-maker / buyer? What issues do they have that your solution can resolve? What would make them want to engage with you and either buy your products or services or meet with a sales person? 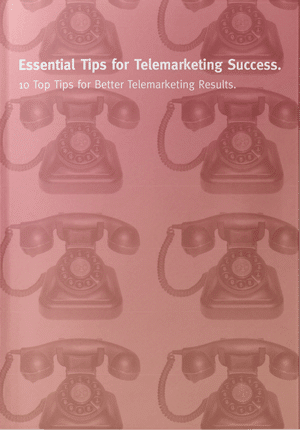 Techniques – there are good telemarketing and bad telemarketing calls. We know when we receive a poor call. Callers need appropriate skills to enhance performance. However you choose to handle your lead generation, the quality of briefing will have a significant bearing on the results. It’s definitely a case of garbage in – garbage out. When briefing telemarketers, the mushroom treatment doesn’t work. You can’t leave them alone in a dark room, feed them rubbish and just hope that they will generate results for your business. Telemarketers need to be well-briefed. That doesn’t mean that they need to know the ins and outs of every technical aspect of your service or product. That’s what your sales team is there for at the time when they visit the prospect following the appointment set up by the telemarketer. Sometimes, too much knowledge can be dangerous. There’s a risk that the caller will over-sell or over-explain and get it wrong on the call. In some cases, it’s possible that the prospect will decide that they’ve heard enough on the phone. In other words, they don’t need to hear the same thing again from a sales person. In the same vein, it’s useful to understand what drives the client need. Is there new legislation? Has the market changed in some way that leads to a greater need for your products or services? Or, have you recently launched something innovative that’s new to the market? It definitely helps to provide your callers with a written briefing. Ideally, follow that up with some form of presentation to those making the calls after which they can ask questions. Don’t forget that ongoing communication is important throughout the campaign. Your telemarketers will learn as they go but regular feedback will enable them to overcome any gaps in their knowledge. Great write-up. Telemarketing team requires these training methods to generate high quality and great leads. Quite interesting post! I can use these methods to to train my people to generate the most genuine and verified leads. Great tips on how to train the marketing team . If implemented, this will surely help to generate the leads.